Five Killeen ISD seniors reflected recently on their numerous accomplishments as they began their final semester of high school. Administrators at Killeen, Ellison, Harker Heights, Shoemaker and Early College high schools chose the seniors as quality leaders at their schools as representatives to be featured in the local Voices United magazine February issue. 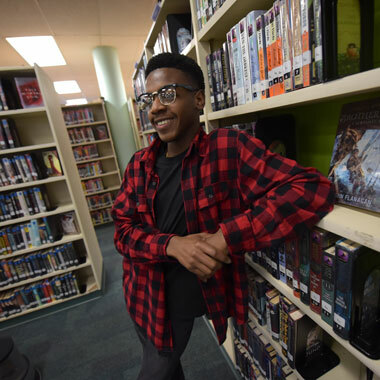 Thoughtfully reflective of his fast escaping time in high school, one Ellison High School senior believes he’s grown up and is ready for life’s next act. Looking toward the future, the senior everyone knows as Jay-Jay said his plan is to perform. Initially, he will be a student at Texas State University, where he will pursue theater studies and hopefully get to direct plays that he writes. From there, hopefully, he will act in television, movies and on stage. The son of Kendra Medlock spent most of his childhood in Killeen, attending Saegert Elementary School and Patterson Middle School before his time at Ellison High School. Now, Wilson said, it’s clear that time does slip away. For younger students entering high school, Wilson said his best advice is to get connected to a group on campus and to avoid trying to fit into someone else’s mold. Always a strong student, it’s performance that has really given Wilson his outlet to excel. He’s written a play about a dancer that addresses sexism and stereotypes. He hopes to write more and to see his work make it to the stage. Adapting and thriving in uncertainty is serving one senior well as she looks forward to graduating with the first class from a unique high school in Killeen. Like her peers, Shanea-Rachelle Dietel knew she was entering the unknown when she applied as an eighth-grader to be part of the first cohort at the Killeen ISD Early College High School. Interest in the new concept allowing students to earn an associate’s degree from Central Texas College concurrently with their high school diploma, was far greater than expected. Dietel began on the new school’s waiting list and spent her freshman year at Ellison High School, where she participated in the Leadership Academy, also a rigorous academic program. As the first group has progressed through Early College, their schedule becomes heavier with college courses and lighter with high school courses. The challenge, Dietel said, has been good for her. As the school has developed clubs and traditions, Dietel found a niche in volunteering through a Rotary Club summer leadership camp and through a volunteer group connected with Central Texas College. Now, she is looking forward to transitioning again, this time to a traditional college student. “I’m pretty nervous,” she said. “I’m about to be thrown into the real world. It will be an adjustment, but we have had to do that here, too.” She said from the beginning teachers held ECHS students to a higher standing. The daughter of Eric and Melanie Horton said she plans to attend Texas State University and to pursue a medical career. 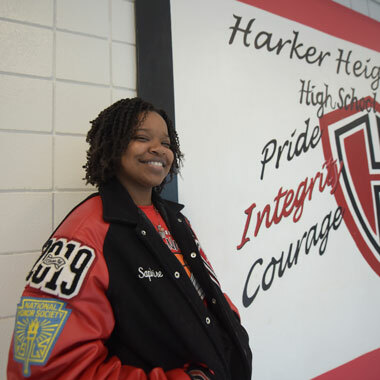 A Harker Heights High School senior with strong academic and athletic skills is achieving in a whole new challenge this year. Saphire Maxwell is in her second year of splitting days between the traditional high school and the dual credit Texas Bioscience Institute at Temple College. She has mastered getting up early, studying extra hard and is on the President’s List at the college for her strong performance. The high-achieving student is also an accomplished basketball player. Maxwell was ready to finish out athletics with a Knights team looking toward a playoff run. However, last season she tore a ligament that ended her playing days early. Looking to graduate from high school this year and continue on a planned pathway to veterinary medicine, Maxwell said her experiences in advanced classes and sports have taught her valuable lessons. Her time at TBI, where she spends all but two classes this semester, has been formative in assuring her of her desire to enter veterinary medicine. Navigating college and high school concurrently means learning to study. “I had to find a way to study and to remember the information,” she said, explaining that studying had been relatively easy before she began college-level classes. The daughter of Tina and Kenneth Maxwell said her parents raised her to have an optimistic outlook and to work hard. “It’s the way I was brought up, to be optimistic and put my mind to it. Anything is possible,” she said. She also praised her coaches at Harker Heights High School for emphasizing that student athletes perform their best on and off the athletic venue. This year, with just two class periods at the high school, Maxwell is taking AVID, a college preparatory elective and theater, her first experience in the performing art. She’s also beginning to come to grips with graduation. Maxwell is considering either Prairie View A&M University or Tuskegee University. 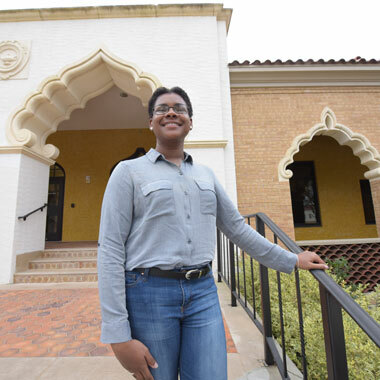 A college preparation class has made a world of difference for one Killeen High School senior plotting her future with confidence. Viktoria Hendricks Bell has learned teamwork, problem solving and communication skills as a basketball player for the Lady Roos. Still, it is her experiences in a course called AVID, or Advancement Via Individual Determination that has really guided her path. She also takes advanced academic courses and is a varsity athlete on the basketball team. “I’ve learned about having responsibility for others in basketball. You have to lift up your teammates and hold one another accountable,” she said. That is a lesson she learned early in life. The daughter of Roshawn and Darla Walker is a middle child with six siblings currently ranging from 5 to 27 years of age. Her dad is an active duty soldier and the family has lived in five different states. 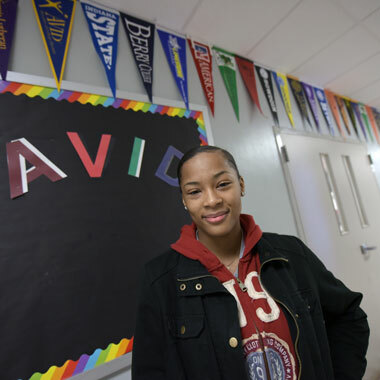 With older siblings to observe and lots of preparation through AVID, Bell has a handle on the future, even though it is uncertain. She is leaning toward starting at a two-year college, but is looking at several specific universities based on a five-hour driving window from home, academic offerings and student-teacher ratio. Her vocational interest is pediatric psychology. That interest also came from experience. She is a regular volunteer at Bellaire Elementary School and with Killeen ISD middle school sports events. She knows she wants to make a difference in the lives of young people. The fast approach of high school graduation is getting real. Strong faith and supportive family, teachers and coaches have propelled one Shoemaker High School senior to strong achievement in the classroom, athletic arena and a variety of music venues. 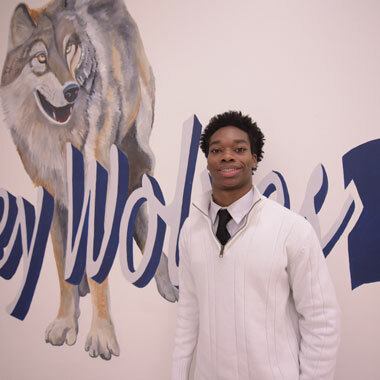 Kazziah Douglas is a defensive back on the Greywolves’ football team and a sprinter on the track team. He also plays drums in the marching band, competes in solo and ensemble events and plays in the jazz band and in his church’s worship band. He also takes advanced placement and dual credit courses. The active senior is weighing his college options. He may continue to take part in sports and in music and is pondering a career in information technology. Considering his success in a variety of activities, the son of Willie and Kathlyn Douglas first credits God and then his parents. “I give the glory to God,” he said. “I pray a lot and try to keep God first in all I do,” he said. He also credited teachers and coaches for working with him to fit his numerous interests into his busy class schedule. Nowhere is that more evident than on the football field, where Douglas managed to play the game and participate in halftime as a member of the band’s drumline. “I take off my shoulder pads and get my drums and get ready to march,” he said, recalling the busy game nights. Though Douglas is preparing to compete this spring running the 200 and 400 sprints in track and an athletic scholarship is possible, it’s another arena that is his favorite. He started banging a drum at age 5 and hasn’t stopped, keeping the beat for the marching band and taking part in a worship band at his church.